Folding electric bikes are one of the easiest ways to get around. These bikes are highly practical and reliable. Plus, the feature of folding provides you with the convenience to carry the bike anywhere you go without any hassle. Above all, the electric folding bikes are much faster as well as much more eco-friendly than their non-electric counterparts. 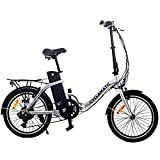 However, it is not easy to buy the best folding electric bike these days as there are so many available in the market. Well, you do not need to worry about anything as we have brought the perfect solution for you. Have a look at our professionally curated list of top folding electric bikes and choose the best one for yourself. Click here to read more about the electric dirt bikes for kids. Folding bikes are something that redefines the term mobility and portability owing to their impressive ability to be transported and above the edge storage solutions. The Ancheer E-Bike is extremely easy to fold which allows better storage options. Plus, comes with an anti-pressure ability and extremely lightweight for ease of portability. Weighing just 26.5 lbs, this is an e-bike features a 350-watt high-speed motor that can touch speed up to 25 km/h. Also, the bike offers a 36 V, 4.4 Ah battery that allows a range of 20 km for the better commuting experience every single time. Bluetooth System & App support. Double layer aluminum alloy wheel. If you wish to carry your bicycle around more often to places where you are unable to ride to, the Go Plus electric bike can certainly meet your demands. As soon as you fold it up, you can just store it in shortest space possible and further make use of it whenever needed. Powered by a 250-watt motor along with a 36V, 8AH battery, you can effortlessly ride for around 30 km in one full charge. To make your journeys even more enticing, you get a completely adjustable seating position and come with a top-notch durability of total aluminium alloy frame. UL approved charger ensures safety. Quick release clamp for faster folding. Carbon-steel front fork with shock absorption. Give an edge to your adventurous travel plans with this outstanding electric mountain bike from the trust of Ancheer. Constructed out of 100% aluminum alloy frame and backed by carbon-steel forks for added durability, this is certainly going to live up to your expectations of thrilling mountain rides. Furthermore, it comes with a 21-speed transmission system for altering speeds, dual disc brakes for certainty, LED headlamp and horn for convincing safety. The motor reads a 250 Watts of power along with a 36V, 8AH battery can run up to 25-50 km at 15 km/h. Low, Mid and High meter operations for you to choose from. Choice of two modes: E-Bike & Assisted Motorcycle. 26” alloy wheels made out of double layered aluminum. Folding bikes are meant to serve you in the most outstanding ways, by allowing to carry your bike wherever you wish to visit. This Nakto model comes with all the interesting features that make it a wonderful product to commute on and try some interesting adventures as well. With the advantage of small storage requirement, you can go on a ride even on uneven roads using this bicycle. The quick release clamp on the bike makes it easy to fold and carry and the adjustment of saddle height makes it better. You can also make your own pick of operational modes. UL approved charger ensuring safety and security. Gift yourself convenience combined with reliability and functionality as the CX2 model from Cyclematic is powered by a 250-watt motor that enables you to ride at speeds up to 15 mph. What makes it more interesting; on this bike, you can choose the mode you want to ride on. Opt for the thrill of a normal bicycle or choose partial electrical assist to make the journeys even more enticing. As you can fold it, next time you are on a holiday, just carry it around and explore the place on your own terms. Runs for 4-6 hours with one full charge. Can cover 25-31 miles with a full charge. The smallest looking bicycle on the list, the Swag Cycle is a foldable e-cycle dedicated to rewarding you with memorable experiences. Powered by a 250-watt motor and 36 V rechargeable battery, all you need is 2.5 hours to completely charge the bike. Besides being powerful, the smart design folds to a very small footprint making it ideal to carry it around. In terms of durability, the bike is constructed out of aerospace grade aluminum that is meant to serve you very long. Also, you get a handlebar display where you monitor battery life and do a lot of other fun things. Comes with a micro USB charging point to charge your devices when you are on the go. 100% electric to eliminate any emissions. Total ride control on the handlebars. 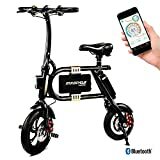 Equipped with really smart features like Power-cut protection, the folding moped from Ferty has a powerful 250 watt motor along with a 36V,8Ah battery and fast charging for added benefits. Also, you get the choice of adjusting the seat anywhere between 80 to 95 cm for people with varied heights. The compact design and lightweight of the bicycle makes it extremely easy to carry it on any mode of transport when folded. 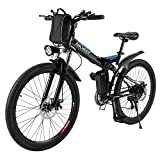 Can be used both as an electric and normal Bike. Riders between a height of 165 cm and 185 cm can ride with comfort. Exceptional customer support and 2 years warranty on battery. Apart from being such a highly workable electric bike, it comes with a 100% aluminum alloy collapsible frame that enables it to be folded extremely easy and fast. Carry it on your vehicle or just store even in the shorter spaces. The trust of Ancheer has been brought forward with this model where you get disc brakes on both wheels for added safety on the move. Furthermore, the bike fits a 250-watt motor and a removable 36 V,8AH removable lithium-ion battery that will make it run for 25-50 km without any troubles whatsoever. Cruise through your favorite places at speeds up to 15 mph and the 7 speed Shimano transmission system makes your ride more enjoyable. Dual working modes: E-bike and Assisted Bicycle. LED headlamp and horn for safer rides at night. 3-speed meter for added comfort and fun. 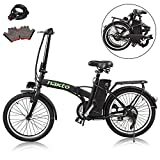 If you are looking for a folding bike that has all the qualities of being a reliable mountain bike and also impressive features to win your heart over, this is certainly one of the best choices to make. To start off, you get an aluminum alloy construction blended with an anti-rust and anti-exposure paint for optimal fun. Next up you get a powerful 36 V, 8 AH battery with fast charging that can serve you up to 25-50 km range. One of the stand-out features of the bike is the strong 26” magnesium alloy wheels with thick tires, making it safer to ride on rain and snow. Mechanical front and rear disc brakes. Dual working modes for enhanced fun. The fun of ultra strong 26” bead spoke wheels made out of aluminum alloy and combined with an anti-slip thick tire to make your adventures more and more memorable. 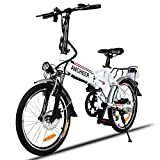 This model is one of the finest additions to the popular line of folding bikes from Ancheer. It delivers a power of 250 watts and packs a 36V, 8Ah battery to make your journeys more captivating. Moreover, you get the accessibility of 2 different modes where you can choose to cruise on electric mode or do some exercise on the assisted mode. Fast charging which charges the battery in 4-6 hours. Anti-rust and anti-exposure painting material. Rain and snow compatible tires. Trust of 21 speed Shimano transmission. 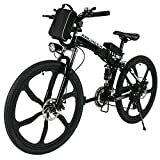 The folding electric bikes are convenient and easy to use. Plus, they help you to reach your destination without harming the environment. So, why wait any further? Go through the list; choose the one that suits your needs and have fun.